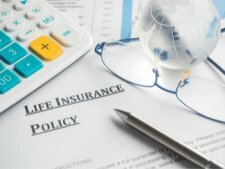 Who are the Parties Involved in a Life Insurance Policy? A life insurance policy is a written contract between a life insurance company and the owner of the life insurance policy. The owner agrees to pay the insurer premiums in return for the insurer's promise to pay a death benefit upon the death of the insured person. This is the person that owns the life insurance policy. The agent is the insurance company. The insured is the person whose life is being insured by the life insurance policy. This is the person who receives the death benefit when the insured person dies. This is the alternate beneficiary who will receive the death benefit if the primary beneficiary previously died. A wife may buy a life insurance policy on her husband. The wife would be the owner of the life insurance policy and her husband would be the insured person. The wife may name herself as the primary beneficiaries to the life insurance. In this case, the wife would receive the death benefit when her husband dies. If the wife had named her children as secondary beneficiaries, and the husband and wife died together in a car accident, the children would receive the death benefit from the life insurance policy on their father. The party being represented – the client. The party doing the representing – the agent. An insurance agent represents his client – the insurance company. The insurance purchaser is the insurance agent’s customer. The purchaser is the client of the insurance company.